Politico: “Stephen Miller pressuring Trump officials amid immigration shakeups” — “As President Donald Trump roils the capital over illegal immigration, his influential aide Stephen Miller is playing a more aggressive behind-the-scenes role in a wider administration shakeup. “Frustrated by the lack of headway on a signature Trump campaign issue, the senior White House adviser has been arguing for personnel changes to bring in more like-minded hardliners, according to three people familiar with the situation — including the ouster of a key immigration official at the Department of Homeland Security, whose secretary, Kirstjen Nielsen, announced on Sunday that she is resigning. 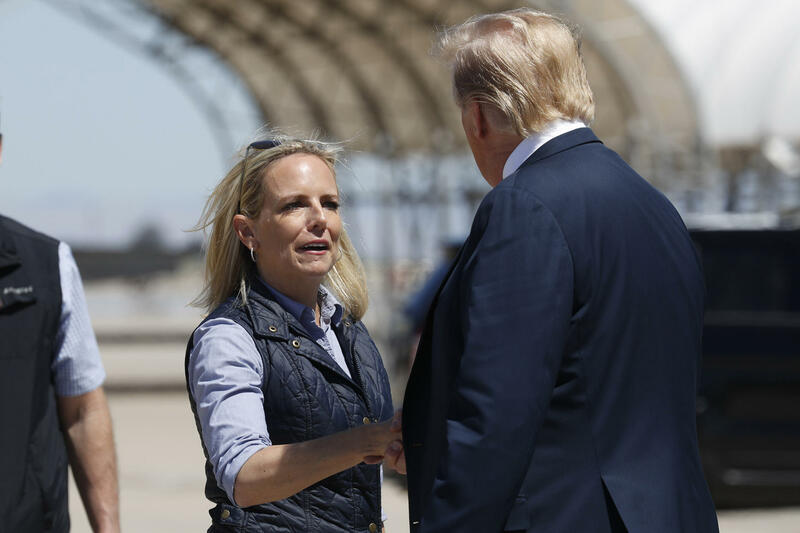 New York Times: “Kirstjen Nielsen Resigns as Trump’s Homeland Security Secretary” — “Kirstjen Nielsen, the homeland security secretary, resigned on Sunday after meeting with President Trump, ending a tumultuous tenure in charge of the border security agency that had made her the target of the president’s criticism. Washington Post: “Homeland Security Secretary Kirstjen Nielsen leaving Trump administration amid surge of migrants” — “President Trump announced Sunday that Kirstjen Nielsen has resigned as secretary of homeland security, marking the exit of a second top immigration official in a matter of days as the White House continues to grapple with an influx of migrants on the southern border. “Replacing her on an acting basis will be Kevin McAleenan, the commissioner of Customs and Border Protection, Trump said Sunday. The announcement on Twitter came shortly after Trump and Nielsen met at the White House, according to two senior administration officials. CNN: “Trump is removing US Secret Service director” — “United States Secret Service director Randolph ‘Tex’ Alles is being removed from his position, multiple administration officials tell CNN. “President Donald Trump instructed his acting chief of staff, Mick Mulvaney, to fire Alles. Alles remains in his position as of now but has been asked to leave. “The USSS director was told two weeks ago there would be a transition in leadership and he was asked to stay on until there was a replacement, according to a source close to the director.